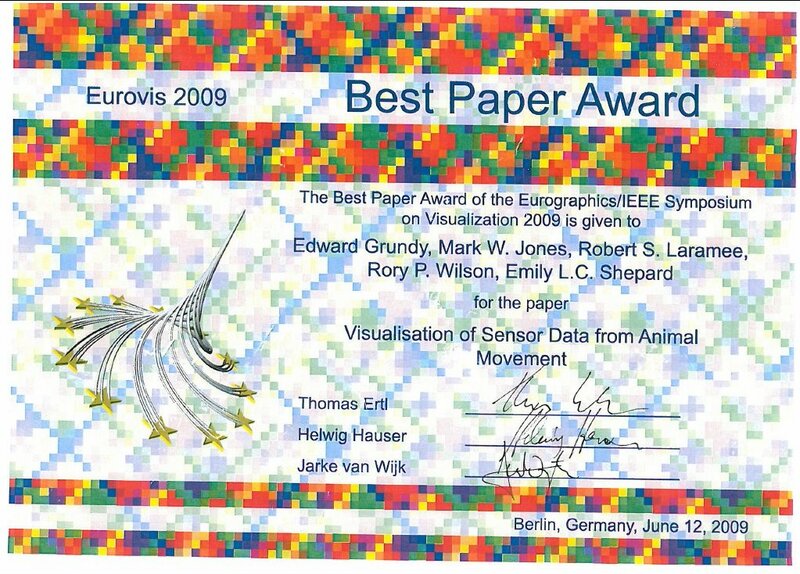 Edward Grundy, Mark W. Jones, Robert S. Laramee, Rory P. Wilson, and Emily L. C. Shepard, Visualisation of Sensor Data from Animal Movement, Computer Graphics Forum (CGF), Vol. 28, No. 3, 2009, pages 815-822 (Proceedings of EuroVis 2009, June 10 - 12, 2009, Berlin, Germany) ( PDF file, video, web page, Infosthetics Article, New Scientist Article, http://dx.doi.org/10.1111/j.1467-8659.2009.01469.x ) -Recipient of the Best Paper Award at EuroVis 2009. Chao Tong, Liam McNabb, and Robert S Laramee, Cartograms with Topological Features, The Computer Graphics and Visual Computing (CGVC) Conference 2018, pages 127-134, 12-14 September 2018, Swansea, UK ( PDF file , video , https://doi.org/10.2312/cgvc.20181217 ) -Received Honorable Mention at CGVC 2018. 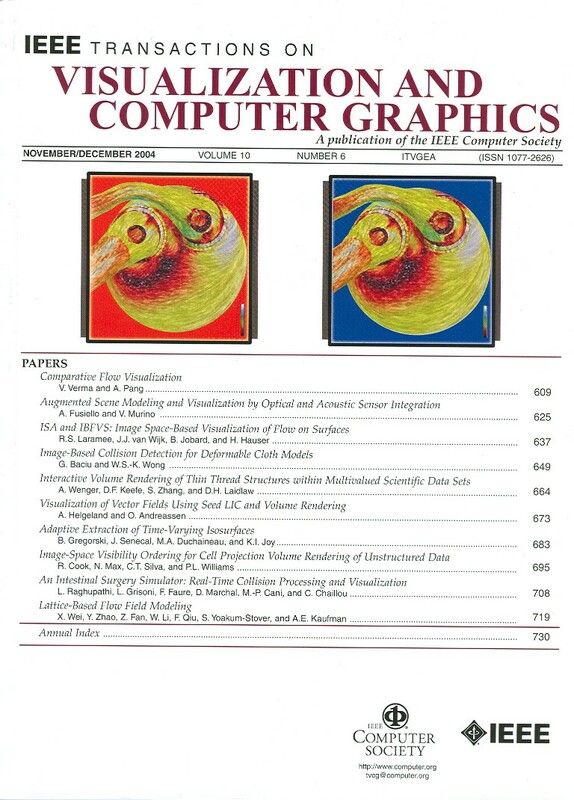 Richard Roberts, Dylan Rees, Robert S Laramee, Paul Brookes, Gary A Smith, RiverState: A Visual Metaphor Representing Millions of Time-Oriented State Transitions, The Computer Graphics and Visual Computing (CGVC) Conference 2018, pages 81-89, 12-14 September 2018, Swansea, UK ( PDF file , video , https://doi.org/10.2312/cgvc.20181210 ) -Recipient of the Best Paper Award at CGVC 2018. Countries of invited talks so far: Austria, Canada, China, Columbia, England, Germany, Holland, Morocco, United States, Wales. Robert S. Laramee, Data Mining with Data Visualization, KEYNOTE Talk at the 3rd International Conference on Big Data Analysis and Data Mining, London, UK, 26-27 Sept 2016. 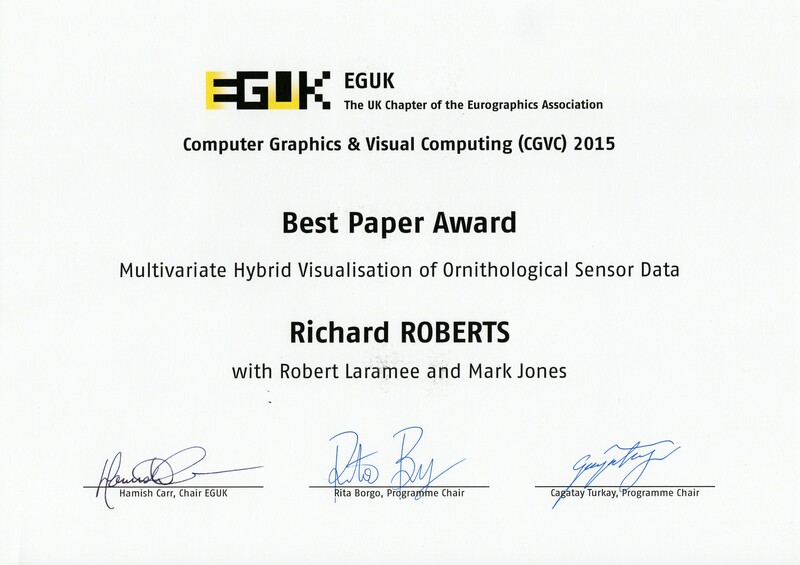 Robert S. Laramee, Visual Analytics for Big Video Data, KEYNOTE Talk at the 2nd Global Summit and Expo on Multimedia and Applications, London, UK, 15-16 August 2016. Robert S. Laramee, Flow As You've Never Seen It, Plenary Talk at the 2nd Global Summit and Expo on Multimedia and Applications, London, UK, 15-16 August 2016. Robert S. Laramee, Multimedia Meets Visualization, KEYNOTE Talk at the Global Summit and Expo on Multimedia and Applications, Birmingham, UK, 10-11 August 2015. BibTeX entries for the above articles can found at The Collection of Computer Science Bibliographies.